“Universal values” such as these, shared by the world’s religious traditions, underscore the essential fact that “we are the same human beings,” the Dalai Lama told 500 Education students from six Quebec universities gathered at McGill on Oct. 3. The Dalai Lama’s free-wheeling discourse in Pollack Hall was punctuated with Buddhist philosophy, Western science, impish humour and infectious laughter. As he noted at the outset, it also reflected a global view shaped by 50 years of living in India and traveling the world. Billionaires, he has found, are often unhappy. Money and material goods bring physical comfort. But they also produce anxiety, stress and “problems.” Internal peace comes from caring, compassion, true friendships. 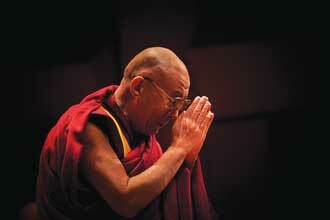 Ethics may be thought of as actions – physical or verbal – that bring some benefit to others, “especially in the long term.” And they aren’t necessarily linked to religious beliefs, the Dalai Lama said. “The major portion” of the six billion people on Earth today are “not much serious about religion.” Some may feel they need pay no attention to religious values such as compassion and forgiveness. But independently of religion, “so long as you are (a) human being,” it’s important not to neglect universal values. Training in secular ethics can help cultivate these qualities. Dialogue and mutual respect are keys to the pursuit of peace. Ecology should also be part of ethical education, since much of the damage to the environment is due to “man’s greed.” Children should be taught the importance of taking care of the planet. Responding to a student’s question about the importance of teaching religious culture, the Dalai Lama drew a distinction between religion and “religious culture.” One can embrace a culture, or way of life, coloured by a religious tradition, without personally adhering to that religion. Peering out at the audience from beneath a red visor, the 1989 Nobel Peace Prize laureate sat cross-legged in his chair for most of the two-hour session. 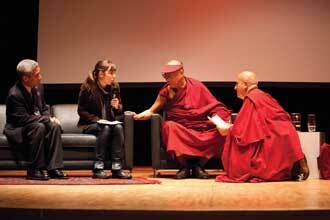 He spoke in English, with occasional help from Tibetan interpreter and McGill adjunct professor Thupten Jinpa. His remarks were translated into French by Matthieu Ricard, who trained as a scientist in France before becoming a Buddhist monk, and whose writings have made him something of an international celebrity in his own right. Some 500 of the 600 participants in the event were selected Education students from Université de Montréal, UQAM, Concordia, Bishop’s, Université Laval and McGill.